- HIGH-QUALITY DESIGN: This colorful straw bag for summer is made of top-quality imported and environmentally friendly materials. Its handmade design makes a perfect summer bag for women that is durable and on trend. - SPACIOUS: Comfortably holds all of your essential items including smart phones, large tablets and lap tops. In addition, two inside pockets and a FREE removable little pouch help to keep your belongings organized and secure. 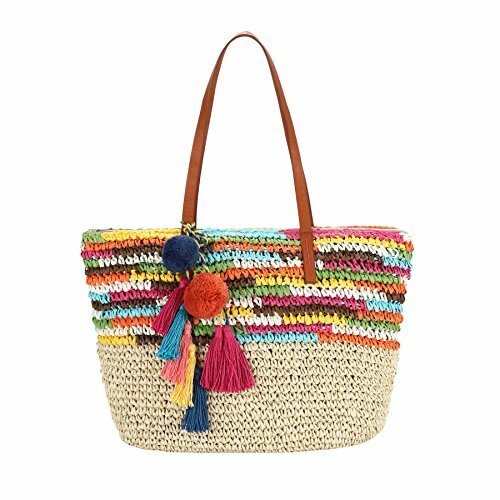 - PERFECT DAILY COMPANION: Our colorful straw tote with pom pom and tassel detail can be used daily to add some flare to your outfits or on vacation, on the beach or by the pool. It will hold all of your essentials to easily take you from day to night.